The aim of this small contribution is to present the reality of Eastern-Roman arms, weapons and military costumes hidden behind the Gospel iconography of the Arrest of Jesus Christ in the Gethsemane Garden in the art of Byzantium, which it is also useful to understand the evolution of the East-Roman military gear through the centuries. The iconography of the Betrayal is of ancient origin and we have examples of it already in the Early Christian art. Since the beginning the soldiers arresting Jesus Christ in the Gethsemane have been represented as warriors of the Roman Empire, whose military accoutrement was generally represented as contemporary with the period when the artists who depicted the event lived. This artistic fashion survived until the end of the East Roman Empire, and the related iconography allows us to discover a great carrousel of military figures showing the evolution of the Roman army and local militiae through the entire Middle Ages. The same iconography in other Western and Eastern medieval states allows us to understand the same military evolution for other countries outside the boundaries of the Roman Empire of Byzantium, so that the representation of the Gethsemane arrest in medieval art is one of the richest sources for the depiction of medieval military equipment. For reason of space I have concentrated in this paper on artistic iconographies of the event only within the boundaries of the Byzantium’s commonwealth, ranging between the 11th and the 15th c. AD. I have also tried to compare some archaeological finds with those represented in the iconographic sources. - They also carried lanterns and torches (μεττα φανῶν καὶ λαμπάδων). This Biblical episode was illustrated in the Christian art of the Roman Empire since the 4th c. AD, as attested by the Brescia ivory casket (lipsanotheca) of c. 360-370 AD.6 It became a topic of the Christian Church iconography and art, increasing especially from the 11th c. AD.7 The artists who represented it followed the descriptions and the details of the Gospels, but of course adapted their paintings to the material culture of their contemporary world. The degree of militarisation of the men arresting Our Lord varied in the paintings, according to places and times. 1 See Franchi de Cavalieri 1928, pp. 205ff. n. 7. 2 Stylianou, Stylianou 1992, p. 570; this word is used also by Matthew (27,27) and Mark (15,16) referring to the soldiers after the delivery of Jesus to Pilate. 3 Stobart 1925, p. 207. 4 According to Lagrange 1912, p. 367, they were not the Guards of the Temple, but a mob gathered for the occasion. 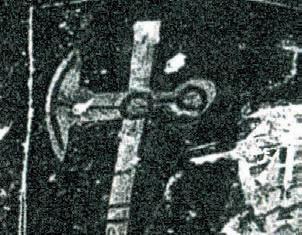 5 Cross 1957, s. v. Temple. 6 See Various 1990, pp. 344ff. cat. 5b.l1. 7 For artistic samples from the 4th to 10th c. see Schug-Wille 1970, p. 48 (Sarcophagus of Junius Bassus, 359 AD); Colomba 1998, pp. 77, 80 (mosaic of Saint Apollinare Nuovo, Ravenna, end of the 5th c.); Romanelli, Nordhagen 1999, p. 35 (fragments of frescoes from Santa Maria Antiqua, early 8th c.); Thierry 2002, pp. 121 fig. 33, 159, fig. 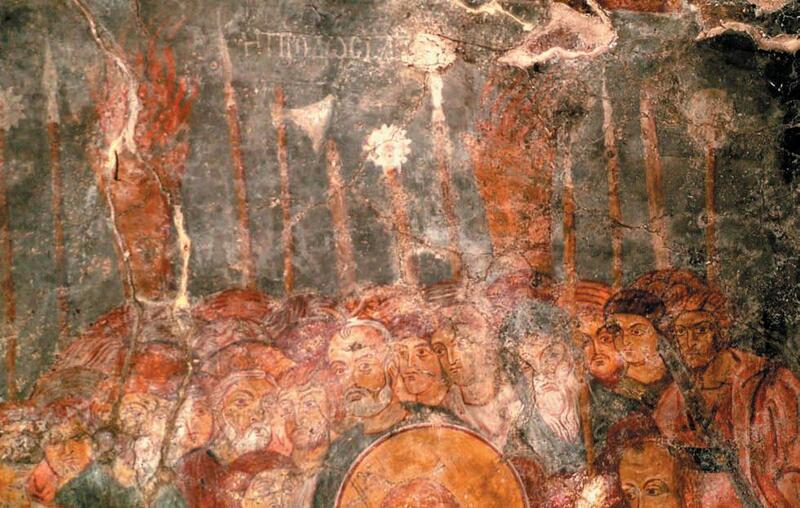 63, 267 (Saint John the Baptist of Çavuşin, 6th-7th c.; Kokar Kilise, second half of 9th c., Kiliçlar Kilise, Goreme, n. 29, chapel XIII, 10th c.). This aspect is extremely important under the point of view of study of military history. It allows firstly to study the evolution of the military costume of the Roman army of Byzantium during the centuries of its history. It allows to help identify the date of weaponry and objects found in archaeological contexts, and to identify Regiments, Ethne, Armies, pieces of military costumes described in the sources. 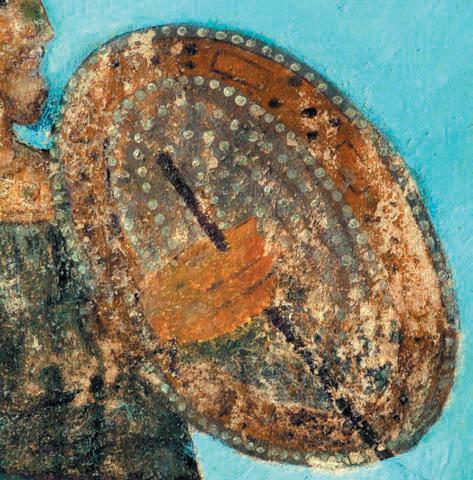 Last but not least, it confirms the reality and the reliability of the East-Roman art in the representations of soldiers and military equipment. To prove it, I will analyse some examples of such iconography, from the first half of the 11th c. to the first half of the 15th c. The chosen range of time is due to the circumstance that examples of such iconography are more numerous and abundant especially in these centuries: not because they were absent in the previous centuries, but because the iconoclast movement and the antiquity of the monuments did not help preserve a lot of paintings in the earlier Churches or other artistic works. 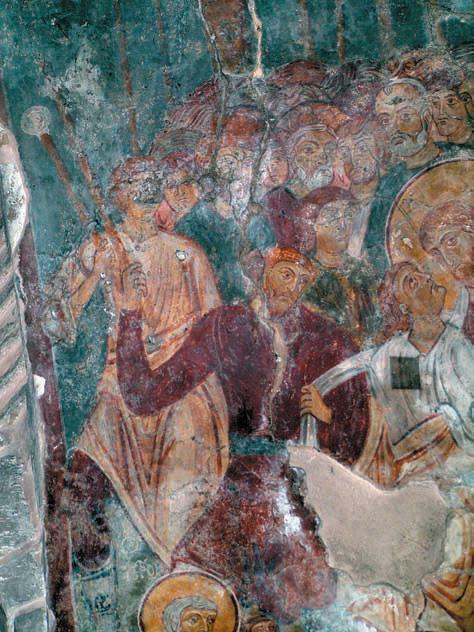 The 11th c: Imperial Guardsmen in the Nea Moni monastery, c. 1043 AD, and parallels. The scene of the Betrayal in the famous Imperial Monastery of the Virgin of Nea Moni in Chios is represented in the inner narthex.8 It shows Roman warriors dressed in a very elaborated way, of blonde complexion and very strong physical constitution (Fig. 1). 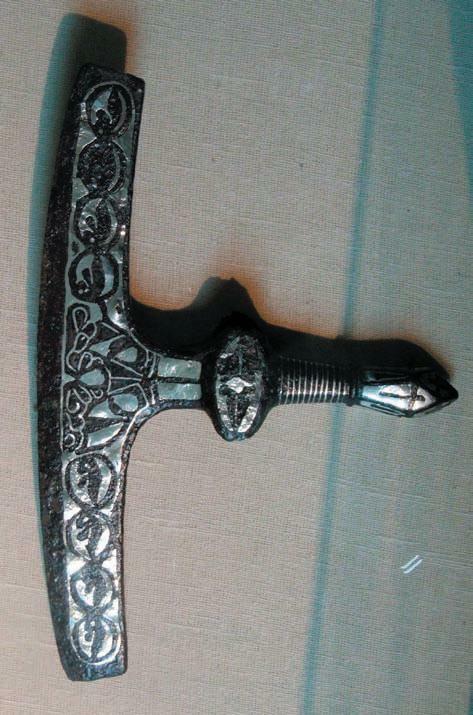 They are armed with staff weapons, in detail with double and single-edged axes, curved blades and maces. One of them wears a very precious shield, decorated with pearls, and the axe is worn on the right shoulder. Some of the shafts of their weapons are brightly painted in different colours. 8 Mouriki 1985, pp. 86-87, 184-186, Pls. 102, 106, 107, 268, 272-273. The men are not represented as clad in armour, but this does not exclude their military character. The luxury of their equipment suggests to me that the unknown artist seems to have used Imperial Guardsmen as models for the Roman soldiers arresting Christ. Their weaponry is partially respecting the Biblical text, because they also have staves and lamps, but their armament is heavy and more typical of professional soldiers, as well as their uniforms are. Did indeed the unknown mosaic-maker use Imperial Guardsmen as models for the speira described by the Evangelists? The Nea Moni Monastery was an Imperial foundation, and the date of the mosaic coincides with the rule of Constantine IX Monomachos (1042-1055).9 The famous Varangian Guard of the Emperors of Byzantium, loyal to the Macedonian Dynasty, was formed by Rus and Scandinavians, often with blonde hair and long beards10 exactly as the warriors on the mosaic. They were dressed at the court in the elaborate Skaramangia (long robes) of the Imperial Guards, mentioned in the Book of Ceremony (De Cer. II, 578) or the Allaximata (uniforms)11 of their own unit (De Cer. I, 225), with decorated Pektoraris. The warriors of the mosaic are indeed all dressed in skaramangia of different colours (blue, yellow, orange, violet, green) lavishly ornamented by an overdressed Pektoraris. These were silk or embroidered squared decorations applied over the main dress.12 Shaped like small mantles, they were coming down from the neck, behind which they were fastened, descending over the breast and sometimes over the entire body.13 One of the few representations of this guardsman’s dress is exactly that of the Nea Moni mosaic (Fig. 2) where, on the person Biblically identified as "Malchus"14 - the servant of the High Priest whose ear was cut off by Saint Peter - the artist detailed even the black laces coming down from the neck and fastening the garment behind it. So there is no doubt that the men represented on the mosaic were mirrored from real Imperial Guardsmen, whose core in that period was formed by the Varangian Guard. The historian Psellos (VI, 87; VII, 24) describes the Varangians as bearing axes or pelekys on the right shoulder (VI, 3). 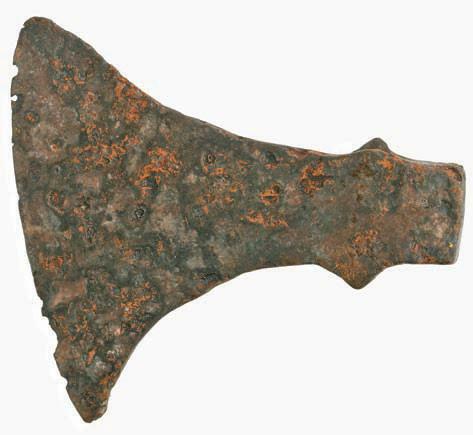 The great Danish axe was the main weapon of the Varangians,15 together with other smaller kinds of such weapons. Another important weapon of the Imperial Guardsmen was the Rhomphaia, a two-handed curved sword, shaped like a medium long pole-arm with a long, narrow blade hooked at the point, or a long pole-arm with a scythed spear-like blade, of about the same length as its hilt.16 Both these weapons are well illustrated in the mosaic. The weapon of Malchus, moreover, presents a shaft painted with one row of brown, one row of gold and one row of green colour (Fig. 2). 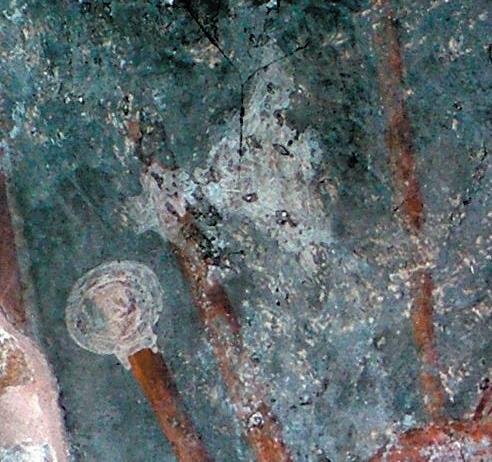 The habit to paint the shafts of the imperial Guardsmen’s spears and pole-weapons in three different bands of colours is well attested since the 6th c. in the famous mosaic of Justinian and his retinue kept in the Church of San Vitale in Ravenna.17 Also this detail of the Nea Moni mosaic may have been therefore copied from the reality, attesting a military attire still in vogue after centuries. 9 Mouriki 1985, pp. 21ff. 10 D’Amato 2010, pp. 22, 43-44, 46. 11 Among the αλλαξιμα there were the σκαραμανγια, the στεμματα, the λωροι, the precious χλαμυδα and the διβητισια; see Kukulès,1953, II,2,21. 12 De Cer., I, 391. 13 Reiske 1830, I, p. 378; Du Cange, 1688, s.v. Pectoralis, Pectorale, col. 237c, 238a. 14 Mouriki 1985, p. 87. 15 D’Amato 2010, pp. 35-36. 16 D’Amato 2010, pp. 37-39. 17 Grabar 1966, pp. 159-160, fig. 171; Southern, Dixon 1996, p. 102 fig. 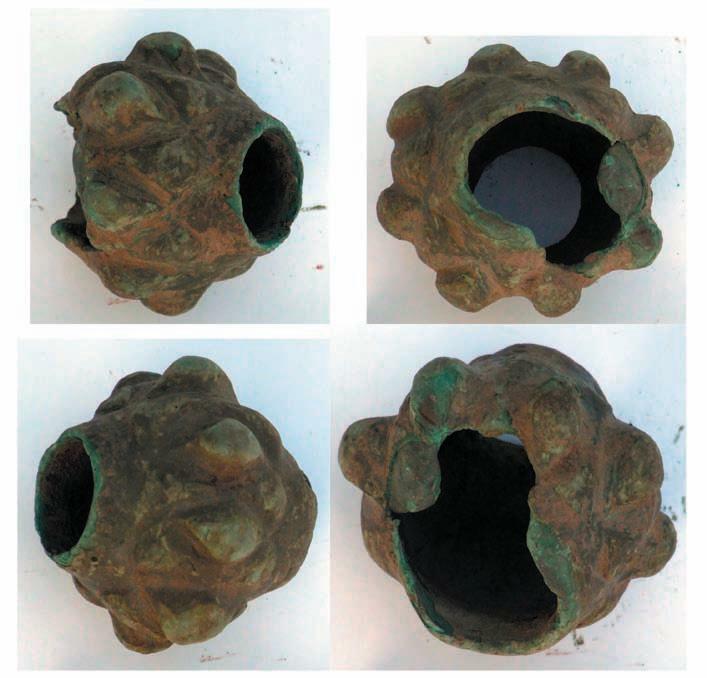 22; the decorated shafts of the Guardsmen are for half of their diameter gilded for their full length, the other side appears to be alternate 2 inch sections in blue and green, separated by narrow half bands of silver, see also Barker 1981, p. 82 fig. 58.
σκουτον χρυσουν χειμευτον ημφιεσμενον απο μαργα-ρων. ετερον σκουτον χρυσουν χειμευτον ημφιεσμε-νον απο λιθων και μαργαρων (golden shield decorated with pearls. A second golden shield decorated by precious stones and pearls)18. Similarly the Imperial Guardsmen fighting and hunting animals in the Hippodrome of Constantinople, represented in the 11th c. frescoes of Saint Sophia of Kiev wear shields identical to that of Malchus (Fig. 3). It is therefore highly probable that the men in the Nea Moni mosaic representing the Betrayal were copied from real Guardsmen and that these Guardsmen were the Varangians. There is one more point to confirm such a theory. For in its horror it surpasses even Hades. Suffer us not to see or recognise each other. 19 D’Amato 2010, pp. 7, 21. 20 D’Amato 2010, pp. 20-21. 21 Beatson 2000-2001, pp. 19-20. 22 Spatharakis 1998, pp. 40-41; Psilakis 1998, pp. 187ff. 23 D’Amato 2010, pp. 8, 15. 24 D’Amato 2010, p. 45. 25 D’Amato 2010, p. 7; Yotov 2003, p. 25; Yotov 2004, cat. 587, Pl. LI, pp. 89, 98-99 fig. 54. 26 About the use of (also) red uniforms by Varangians see D’Amato 2010, pp. 39,40,44; also D’Amato 2005, p. 36; Blôndal, Benedikt,1978, pp. 206-207. 27 D’Amato 2010, p. 16; reconstruction in Pl. C3. From these first data we can conclude that: the depictions of the soldiers in the Gethsemane scene varied according to the places, and that, in respect of the Biblical canons, the appearance of the armed mob arresting Jesus Christ was derived from contemporary models, even represented with their own weapons and accoutrement, in such a detailed way that we are able to recognise men belonging to famous historic regiments of the Eastern Roman Empire. However, the represented warriors were not generally represented as clad in armour.